Q&A: "We Will Write About Them"
KANO, Sep 6 2008 (IPS) - While formal publishing companies in Nigeria languished through the economic crises that accompanied the structural adjustment programmes of the late 1980s and early 1990s, young Hausa writers began writing about their lives and contemporary problems they faced. Bypassing formal publishers, they self-published their novels, often with the help of a writers' cooperative. Although the books were dubbed ‘littattafan soyayya’ (romance novels) for the predominant themes of love and marriage, the novels – written in colloquial Hausa that reflects the rhythms of everyday speech – also serve as muckraking critiques of a corrupt elite and the failures of the older generation. Women writers dominate the field, perhaps because of the large female readership; their work explores the daily life and tensions of women’s lives in contemporary Northern Nigeria. 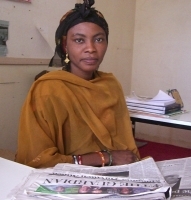 According to Balaraba Ramat Yakubu, the head of Kallabi Writer’s Association, a group of women writers, there are over 300 Hausa women publishing novels in Northern Nigeria. The large female readership has caused anxiety, mostly from male authority figures, about a supposed negative effect the novels have on young girls. In May 2007, A Daidaita Sahu, the Kano state agency for the ‘reorientation’ of society, organized a book and film burning at a local girl’s school. That book burning, however, was a tame threat compared to the new requirements that the Kano State Censorship Board, under the leadership of Director General Abubakar Rabo Abdulkarim, is seeking to impose on writers. In a letter to Kano's five writers' organisations dated Aug. 12, the board confirmed that it wanted each writer in the state to register individually before they can publish or distribute writing. At 25, Sa'adatu Baba has twenty-three books in print and another twenty that are not yet published. She is also an executive committee member of the Association of Nigerian Authors and a student of Languages at Bayero University. She spoke with IPS writer Amina Koki Gizo in Kano on 16 August about her writing and the current crisis Hausa writers are facing. IPS: When did you start writing? Sa'adatu Baba: I started writing in 1997. I write to educate – because through writing you can send a message to the people. Also, it soothes my worries. If I write something down, it is past tense. I just forget about it. So, it helps me psychologically and it sends a message to the people. What is your bestselling book so far? Ban K’arya Alkawari Ba. (I do not break my promises). It is a story about love. When I released the book it sold out. I published more than 20,000 copies. We are always reprinting the book, but the more we reprint the book, the more it is finished. I can’t count how many times I have reprinted it. Now, I keep the plate with the publisher because it is always working. There is no need to take it back home. IPS: Tell me about some of the problems you are facing and the current crisis with writers in Kano. SB: The problem we are facing is lack of understanding. My book Mu Kame Kanmu (Keep Ourselves Safe) is about HIV and how it is spread in our society. I wrote it because one of my friends became an HIV victim. She lost her daughter and separated with her husband as a result of this virus. So I decided to write a book about it. When the book came out in 2006, some were asking me to put it into the newspapers, because some are reading newspapers and not reading books. So, I serialised it in the newspaper "Albishir", from Triumph publishing company. After I finished serialising the work, there was one special assistant to the Kano State government, Abdullahi Musa, who attacked me personally. He said I collected millions of naira from European countries to spoil our culture. I was offended because most readers take my advice. They call me and say this message is very important… I felt discouraged when he criticized, not my book, but me in person. It’s a false allegation. Nobody gave me anything to publish my book. I am the one who wrote and published it myself . IPS: How do you respond generally to people who say that writers are spoiling culture? SB: I don’t believe in that. A writer is a responsible person in the society. As a responsible person, you cannot write something that can spoil culture or children. All of us writers are respecting ourselves, and we are respected and loved by our fans. I don’t think we have a problem with the society. We only have a problem with this Kano State government. (In one of my books, the heroine) is crying terribly, so the husband takes her veil and tries to wipe the tears. But they say it is wrong, just because the husband wipes the tears. So, since he says we don't have the right to write about family or love, we are now beginning to write our next books on government. We will stop writing about social issues, we will write about them. The way they are killing people on election day. Many can lose their souls because of the election and the election rigging. If I have money I will write a book about government and release without fear. I think that nobody can attack me since they say they don't want love stories. If I write about government, I don't think there's anything they can do. Even if they will do something, it is fact. [The censorship crisis began] after a film actress used her phone as a video camera when she was making love with her boyfriend, they took the matter to the censorship board… They decided to bring law and order to the filmmakers. The writers didn’t do anything, but they asked us to register our writers association… Later on they said booksellers should register. And after booksellers, publishers, and writers should bring their books to censor before we release them. They told us that some of our books were spoiling children. We said we did not write our books for children, and we did not say anything against children. But they insisted that we bring the books for censoring. If you take your book there, you will pay them and they will censor the book. They will look for romantic scenes and cancel them. But now, they said each writer will have to register individually. We will have to be registered before we will write anything. They will open a file for us and note everything about us and write it down and file it. IPS: What did the writers and the Association of Nigerian Authors' executive do in response? SB: We called a three week strike for warning. Our elders said we shouldn’t write anything. We can write down what is in our heart and our thoughts but keep it without publishing because we don’t have the right to publish anything. Then we wrote a reply to Malam Rabo about the letter he sent to us. We told him our strike is through. That we would resume writing our books by tomorrow, without taking our books to him. He said every writer should register, but in the next statement, he said that if you could read the book in front of your parents without any shame… go ahead, don’t take the book to his office, distribute to the market. So some of us said that they will use this statement to release their books into the markets. But I know that next time, in the next interview, maybe he will say that the journalist has written it, he was not the one that saying it, because he is always saying things that he denies later. What he will tell you in his office is not what he will say in the media. Even yesterday, an Organization for Islamic Values Protection produced some papers in the mosque, they accused writers, saying some of us are agents of Jews and Europeans. They are intimidating society to hate us. But in Islam, what Malam Rabo has done is not acceptable. It is not in religion. What I believe is that he is using religion as a cover. This is not good. Because of this, I think I will not release any of my books because I believe that he is looking for a way to attack us. I will wait till this government has finished their time and is gone so that I can go and write. We pray that a new governor will come, who will allow us to write. IPS: What are you hoping to do in the next few years with your writing. SB: I think what I will do is that I will write. I will keep on writing, but I will keep it aside, not publish it. In the next two years, the tenure of this governor is due. So what I wish, what I pray is that a new governor will come – that his government will not accuse us. What we want here: we want writers all over the world to look at the situation we are in now in Kano State-to help us in any way they can. As soon as they read my interview, I want them to help us, because we are in a worrisome situation. * Since this interview, the Kano State Censorship Board has agreed – following meetings with national and state representatives of the Association of Nigerian Authors – that the various writers' associations will be registered, not individual writers.